A conceptual picture of the general circulation features of the earth’s atmosphere, including the ITCZ. Fig. 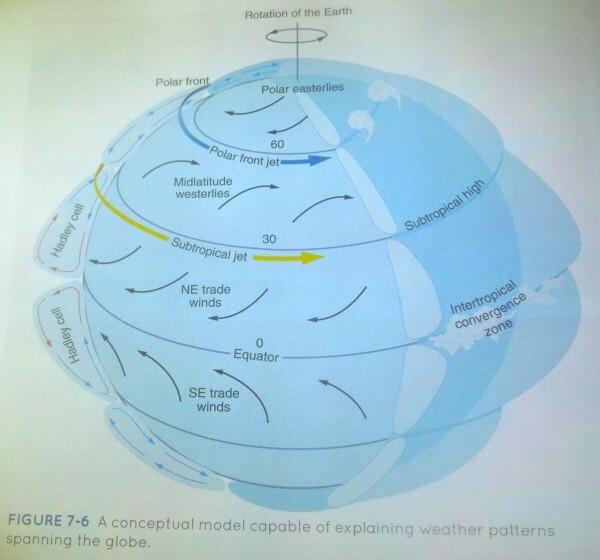 7–6 from Ackerman and Knox, Meteorology: Understanding the Weather, 2015. KIRITIMATI ISLAND, Kiribati — The Intertropical Convergence Zone. The ITCZ. Every student in an introductory meteorology class learns about it. It’s the region near the equator where the northeast (Northern Hemisphere) trade winds and southeast (Southern Hemisphere) trade winds meet. It’s a phrase and some big puffy clouds on a figure showing the general circulation of the atmosphere. It’s a special line on a surface map, a bright red “ZZZZZZZZ”. It’s a long smooth east-west band of rain on a monthly satellite map, or a long broken band on a daily satellite map. Sometimes in the eastern Pacific, there’s a “double ITCZ”, two parallel bands of clouds and rain stretching for tens of degrees. Very tidy. Very neat. Daily satellite-based precipitation estimates from early (left) and middle (right) March. Both show a double ITCZ in the eastern central Pacific, with a more unified ITCZ to the west. 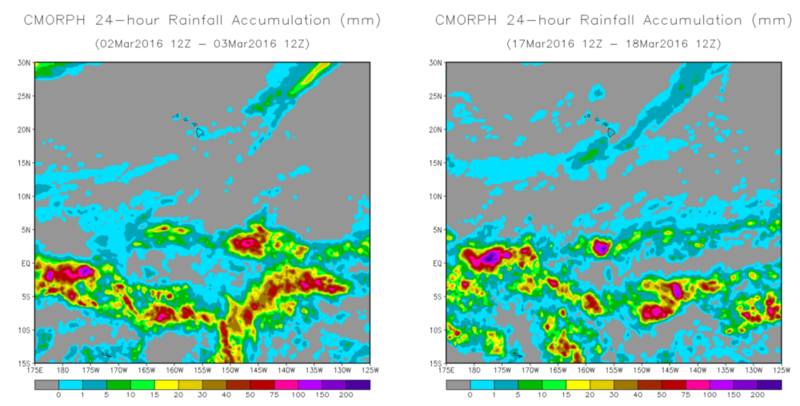 We recorded about 60mm during the 24 hours shown on the right, and about 90mm in the following 24 hours. But here, on this blip of ground surrounded by the equatorial east Pacific Ocean? What’s the ITCZ? It’s hard to pin down. One satellite product said we were in the thick of it; a surface analysis said it was 10° to our east. This analysis from 8am on 20 March (LINT) is the first I’ve seen to actually extend the ITCZ over Kiritimati Island. For us, it’s the line of clouds that’s always in view off the northeast coast of the island, where our hotel is. It’s the dark bank of grey to the northeast, half-hidden behind that towering cumulus cloud and the rain shaft beneath it. It’s the 6″ of rain we received on March 17 and 18, and the 15″ our rain gauge recorded in the first 17 days it was up. It’s the gusty winds and the driving the rain into Scott’s face as he worked on filling the balloon, almost smashing the radiosonde package into Alex’s head as he shot video of this afternoon’s launch. It’s loud, but not with the thunder many of us expected. Only Paul has heard thunder here, and only once. A look at global lightning data shows that the east Pacific ITCZ has had very little electrical activity during this deployment. Its loudness comes from the waves crashing against the reef, and from the rain beating against roofs and walls and pavement. And it’s the spaces. The rain that didn’t fall here, but on the bird sanctuary in southeast Kiritimati. There’s a distance that stays between us and that bank of clouds on many days. The bright sun between showers. The clear atmosphere above cumulus clouds that never got saturated enough to rain. Not so tidy. Not so neat. I’ll never look at those “big picture” views of the ITCZ in quite the same way.